In the age of social media, as users are presented with an increasing amount of content, it’s important to stay on top of the game. One place to start? With effective social media design, which supports brand recognition and connects a target audience with products and services. It can feel overwhelming to start planning the look and feel of your social media, but if you keep these four social media design techniques in mind, you can really help your brand stand out. If you look at the social media pages of any well-known brand, you’ll see the same colors throughout—from the logo and text to the imagery. It’s best to choose two to four colors to maintain consistency throughout all social media and marketing outlets. Brand guides are a good place to start, as this example we created for one of our clients demonstrates. Your font pairings should match the personality of the brand and key messaging. Should it read as strong or simple? Cute or elegant? Always keep your title the largest font in your design—this is where you show the most personality. In contrast, your subtitle and body font should be easy to read. Keeping uniformity in the font pairings will consequently improve the overall effect of your brand strategy. Always strive to choose imagery with consistent themes and filters. Filters add harmony to graphics in a quick and easy manner­­­—this is a big plus on social media. Many applications are available—such as Canva and the VSCO app—that allow you to save and edit filters so they may be applied to all of your postings. Like all graphic aspects, consistency is key. 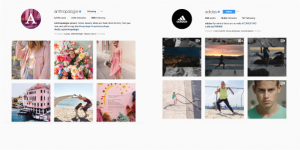 Consistent themes and filters really help your brand stand out. Creating templates for social media postings ensures that all elements of the brand are working in harmony. Keep in mind that each social media platform has different optimal image dimensions. You should organize and size your graphics in a specific way for each platform; however, your colors, fonts and the placement of your logo should remain unchanged across all of your designs. Colors, fonts, filters and templates are all essential elements in making your social media stand out. As social media use continues to rise, your brand’s visuals are even more important. Always remember that consistency is key—and Marketwave is here to help if needed.